Why use disposable baby wipes when you can wipe away baby's messes with gentle, non-irritating bumGenius! Bottom Cleaner spray made from all natural and organic ingredients. bumgenius! Bottom Cleaner makes diaper changes refreshing for both mom and baby. The all natural and organic ingredients are gentle and non-irritating - even on the sorest baby bum, and the light, 100% natural clementine scent reduces odors. Cucumber Extract - A very mild astringent, the juice from cucumber also has moisturizing abilities. Cucumber Extract is a soothing juice that is recognized as a great skin reliever and revitalizer. Aloe Leaf Juice - Known for its healing properties, the aloe plant's juice has proven anti-inflammatory and anti-microbial properties. Because it can both soothe and heal, it is perfect for diaper rashes and/or burns due to sickness and/or diarrhea or loose stool. Moisturizing and softening the skin, Aloe Leaf juice also relieves itching and helps kill fungus and bacteria. Easy to use! Simply spray it on baby's bottom! Spray the Bottom Cleaner on baby's bottom and then wipe clean with any reusable cloth baby wipe or dry, soft cloth. 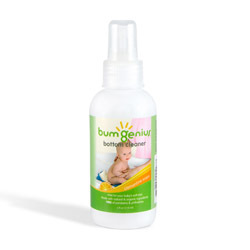 It is unnecessary to wet your baby wipe when using the bumGenius Bottom Cleaner. Reusable Cloth Baby Wipes are recommended to use with bumgenius! Bottom Cleaner. When using the bumGenius! Bottom Cleaner, you will not want to use disposable baby wipes. The first reason is apparent, and discussed above, it is an unnecessary expenditure. Disposable wipes are wet, to use this spray you need cloth baby wipes or a soft, dry cloth of any sort will do. In addition, the unnatural ingredients found in a disposable baby wipe may negate the healing properties of the all natural and organic ingredients found in the spray. Take an environmental stance with your baby's bum! Disposable baby wipes are NOT readily biodegradable, but instead, made from synthetic, non-woven fabrics similar to dryer sheets. Karen Klages of the Chicago Tribune reported, "If someone were to load all of the disposable wipes purchased by consumers in North America last year onto 18-wheel semis, the caravan would number 9,000 trucks and stretch for 68 miles. And it would be carrying 83,000 tons of these seemingly ephemeral cloths_which are anything but fleeting." Choosing cloth baby wipes and solutions like the all natural baby spray, bumGenius Bottom cleaner, reduces the load on landfills and makes a smaller ecological footprint for you, your family and your baby. Clean feel after, no residue left. 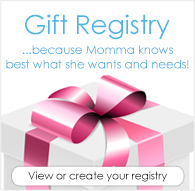 Does not irritate our daughters skin, works great with any wipe. i got this to use with my grovia wipes (which are awesome by the way), but i wasn't that impressed. it smells really citrusy, and it cleans ok, it's just not my favorite item, and a little expensive for washing buns. i will finish the bottle but probably not buy it again. i do like that it's made from natural ingredients though, so that's a bonus. This spray smells so good, and my LO's bum is so soft after wards. Love it. I like that this is natural and less expensive than buying baby wipes. The only thing is, I wish it came in an unscented version. I'm sensitive to smells so I wasn't pleased with this one. This is a convenient, good product. It isn't my favorite cloth wipe solution, but I didn't have any problems with it.